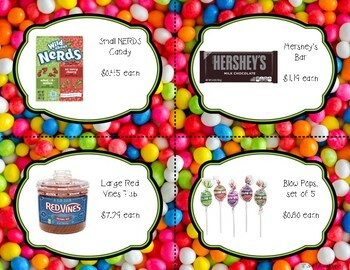 Decimals have never been so fun when you’re a kid in a candy shop! 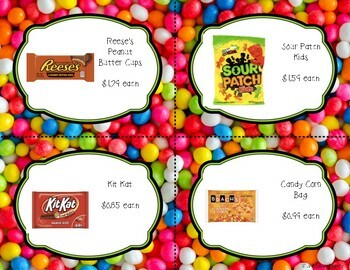 Students become imaginary taste testers for a leading candy company – but to get their order of candy samples, they need to add, subtract and multiply with decimals to give an accurate invoice to the company! 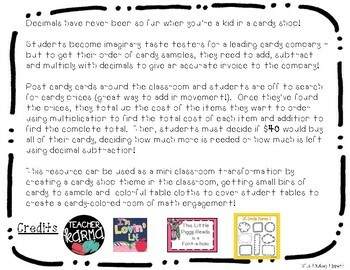 This product includes student worksheet pages to record thinking and show their math calculations as well as full color candy cards to print and post around the room to increate engagement. 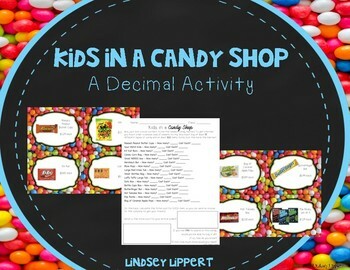 This activity also has suggestions for an easy candy shop classroom transformation! *Click the green star next to my store logo to become a follower of my shop! You will now get email updates about new releases and sales! *Simply go to your My Purchases and click on the Provide Feedback button next to each purchased product. Leave a quick review and rating for the product and just like that - you just earned credits toward future purchases! I love hearing your feedback so I know what resources are most valuable to your classrooms!